I am a big fan of Scottish textiles and particularly Scottish textiles heritage. I am not much of a stitcher (more about this later), but I know a piece of outstanding beauty, artistry and craftsmanship when I see it. 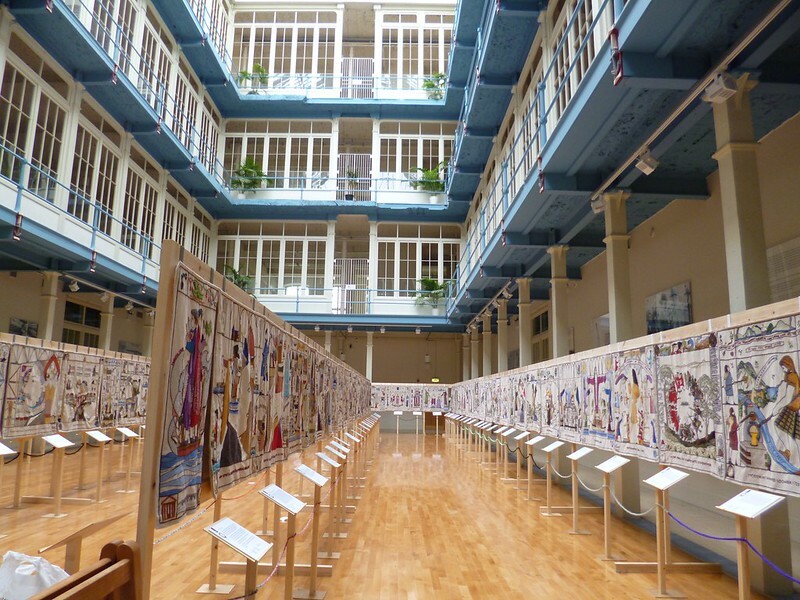 The Great Tapestry of Scotland is such a thing and it is currently on show at Paisley's Old Anchor Thread Mill. I caught up with stitcher, event committee member and volunteer co-organiser, Paula McKeown. First, could you tell me what The Great Tapestry of Scotland is? The Great Tapestry of Scotland is simply Scotland's story in tapestry form. It tells the country's history over 160 panels handstitched by around 1,000 volunteer stitchers all over the country. The author Alexander McCall Smith saw a tapestry depicting the Battle of Prestonpans and he loved it so much he had the idea that he would tell Scotland's story in that way. The main challenges were really to pick what history to show and then coordinating the over 1,000 stitchers. So McCall Smith involved Alistair Moffat, the historian and Andrew Crummy, the artist. How did you become involved in this project? 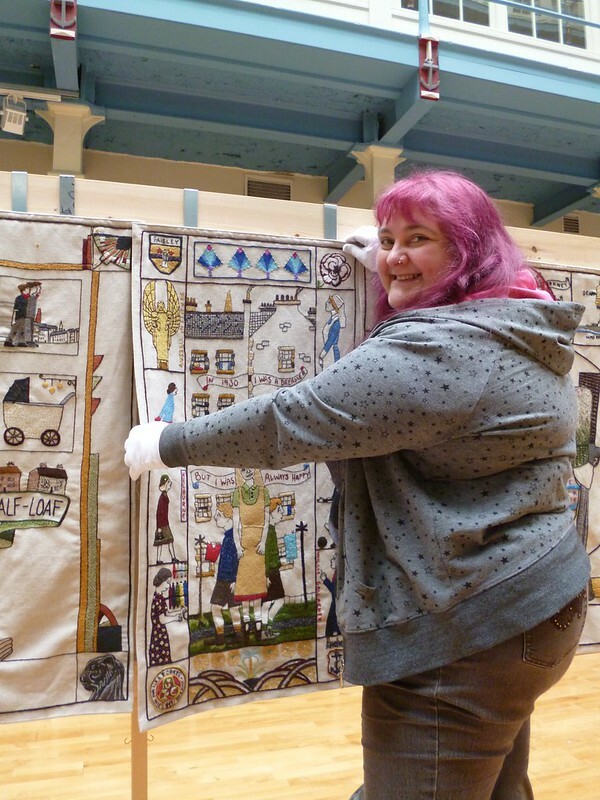 I know it was a real challenge to bring the Tapestry to Paisley - but you were involved before then? I went to see the Prestonpans Tapestry at the Anchor Mill last year and got talking to the people about stitching. When they found out I am a stitcher, they asked if I would like to help stitch the panel they were making for the Great Tapestry of Scotland. I jumped at the chance as I had tried to volunteer to stitch a panel already and had been told it was too late to volunteer. I went back the next week and started stitching on the panel that the Thread Mill museum were making about tenement life in the 1930s. I got involved in getting the Tapestry to Paisley simply by stitching on the actual Tapestry panel. We were then offered to stitch two panels for the Diaspora tapestry so I stayed involved helping with the museum and working with other stitchers. When the chance came to bring the Tapestry, the vice chair of the museum, Margaret Muir asked me to help. How did the Thread Mill Museum end up showing the Tapestry at the Anchor Thread Mill? I know it is a small, local museum with limited resources. They asked us! We realised we couldn't do it alone so partnered with an Arts group called Weaving Musical Threads and West College Scotland. We put a joint bid together and happily the Tapestry trust was happy to give us the chance to stage it. The Thread Mill Museum tells the story of Paisley's thread manufacturing history. Paisley was home to many mills, and the Coats and Clark families developed their businesses from Paisley, taking their threads all over the world. Sadly all the mills in Paisley are closed now. As the mills closed, the Old Paisley society started to collect items associated with the Mills and eventually the Thread Mill Museum was opened with former mill workers acting as guides. As time goes on unfortunately there are fewer and fewer mill workers still around, so we are always looking for new volunteers to help keep the mill stories alive. The museum has lots of equipment and items from the mills and information about what mill workers' lives were like. We also have a lot of stitched and crochet items made from Anchor threads and yarns. We are located in the basement of the Mile End mill building which is now a business centre. The owner of the building, Marcus Dean, donated the space to us and helps us out too. Can you tell me about the different techniques used in stitching the Tapestry? Strictly speaking, the tapestry is not a tapestry as tapestries are woven. The techniques involved are based on crewel work embroidery which is traditionally worked on linen using wool. The major stitches used are chain, heavy chain, stem, Quaker and various straight stitches. The linen is from a Scottish company, Peter Greig & Co, and the wool used is Appleton's wool. The stitchers were given a coloured drawing and wool in the those colours. What stitches we used was up to us to decide. The panel borders did have to be done in heavy chain stitch and the lettering was all done in Quaker stitch. Which panels are your favourite? So many are favourites. Naturally I love the one I stitched on - No 130 Tenement. No 140 Cumbernauld is a big favourite of mine, the embroidery is amazingly beautiful. The design is so modern and distinctive - and it shows how embroidery can be modern, I love the scene from the movie Gregory's Girl in the panel. I would have loved to have stitched on panel 107 Mill working because of the gorgeous Paisley pattern motifs in the dress. Also Panel 105 Paisley pattern for the same reason. Panel 92 Scots in India has much amazing colours. Every time I see the panels, I pick a new favourite. What should visitors know about the Tapestry exhibition? It's open Tuesday to Sunday 10am to 6pm and open late on Wednesdays and Thursdays until 8pm. The venue is the Atrium of the Old Anchor Thread mill -a gorgeous space. The venue is on the 1st floor but there is a lift available. The Thread Mill Museum is nearby but is only open Wednesdays and Saturdays from 12-4pm. Finally, any books resources for people wanting to know more? I have signed up for a stitching workshop with Paula. I haven't stitched since I was about 15 years old so I love the chance for a refresher's course. There will be other workshops running concurrently with the exhibition - keep a look out on the websites and the twitter feed for more information. And so my brief liaison with Scottish politics continues today with a letter asking me for my vote in the Scottish Labour Party leadership face-off. Seeing as I am not a member of Scottish Labour, receiving an actual, real ballot is slightly .. surprising. It reminds me that I am an expat. I know my Danish Parliament/Folketing. I know exactly who I will be voting for come election time (for, lo, I retain my general election voting rights in Denmark). Scotland? I'm not able to vote in the British general elections, but I will be voting come next Scottish parliamentary election. The Scots have fewer parties than the Danes, but that does not make it any easier to decide. Au contraire. Thankfully it seems as though I will have some time to figure things out as the next election is about three years away. I have adjusted to the fact that I am now living "elsewhere". And, no, I don't think I'll be casting my vote in the Scottish Labour leadership face-off. I can't think of any good reasons to do so. I don't know about you, but I think it is decidedly odd to see marathon runners on Tiananmen Square. The sight underlined why I think these Olympics have left me feeling uncomfortable whenever I have caught some coverage. Witnessing the British media mysteria surrounding these Olympics Games has made me decide to be out of Great Britain during the 2012 Games. I mean, the British media is now touting the British handball teams as potential gold medallists despite their team being made up of netball rejects and people (of Scandinavian ancestry) who have played handball for at least three years..
And the entire, erm, complexity of describing Great Britain as a nation is no more evident than knowing the Mayor of London is in Beijing representing his city's (and nation's) 2012 Games. I would be hard-pressed to explain how Boris Johnson ended up as London Mayor, let alone as a politician representing Great Britain. I'd pay good money to see him saunter down a Glaswegian street.. I think word of the day shall be: bemusement. PS. It's been quiet around Fourth Ed. but I've been working behind the scenes. I'm still looking for a solution to a few issues, but I'm happy with the changes I've been making (and hopefully you will not have noticed any of them). Your Presence Is Kindly Requested..
Today has not been the best of days for various reasons but one thing does amuse me: David and I are on the guest list to an exclusive event at the Scottish Parliament. My life sometimes surprises even me. One of my current preoccupation is the idea of public writing - that is, writing/lettering/typography found in public places and spaces. I take photos whenever I see somebody doing something interesting - whether they be commissioned or non-commissioned pieces. I have even tentatively put together a small Flickr-set of some of my photos. One of my favourite examples stem from my erstwhile hometown of Copenhagen, Denmark. I was walking along a wall when I noticed the street name elaborately carved into the bricks. Above the carved brick you had the traditional blue-white street sign with the same name. Two centuries of labelling streets in one go. I was excited by the juxtapositions: permanence vs. easily replaced and serif vs sans-serif. I was also excited by how the contemporary street sign had been placed higher than the carved brick as if to exercise its dominance, its importance. One of my Scottish friends, Fi, works as a curator and we recently spoke about the concept of public lettering and writing. Fi mentioned that the first thing was sprung to her mind was the Scottish Parliament's Canongate Wall. It is absolutely fascinating: various stones with quotes on Scottish identity and history are inserted into an outer wall, so anybody walking along the street will be asked to reflect upon Scotland, art and identity. Even the pavement has slates engraved with sentences. And, as I agreed with Fi, that is really a great example of public space and writing being combined to great effect. And then you have non-commissioned stuff like graffiti and posters and random notes put up in windows..